It’s only October and your kids are already tired of their brown-bag lunches? Try these four healthy, delicious, and affordable lunches they’ll love, from Ellie Krieger, R.D., star of the Cooking Channel’s Healthy Appetite and author of So Easy. Each recipe serves four (you’ll be tempted to take them to work with you, too! ), but you can modify them into a single serving. 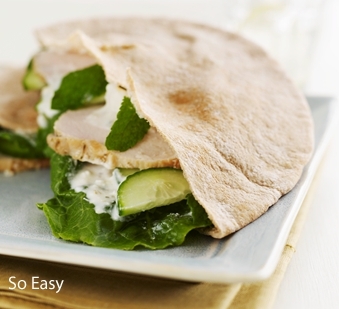 For the sandwich: Cut 4 whole-wheat pitas in half. Line each pocket with 1/2 a leaf of Romaine lettuce. Spread 2 heaping tablespoons of feta spread into each pocket, then fill with about 6 cucumber slices, 4 mint leaves, and 3 slices of roasted turkey breast. You’re done! Get reduced-sodium whole-grain crackers such as Triscuits. Cut slices of mozzarella cheese and tomato into squares to fit the cracker. Put the cheese and tomato slices between the crackers for a healthy crunchy lunch. Spread 2 tablespoons of natural-style peanut butter on each of four whole-wheat wrap breads. Evenly distribute 2 peeled and sliced bananas, 4 chopped large, pitted dates, and 1 teaspoon of ground cinnamon among the wraps. Roll and go. Cook 8 ounces of bowtie pasta, drain, toss with 1 teaspoon of extra-virgin olive oil to prevent sticking, and cool. In a large bowl, toss together the pasta, 1 cup each of corn kernels and shelled Edamame (thawed if frozen), 1 medium diced red pepper, and 1/2 cup of shredded carrots. Add 3 tablespoons of extra-virgin olive oil and toss, then add 1/3 cup of grated parmesan cheese and 1/4 teaspoon of salt and toss to combine. the planet, you save money, too. 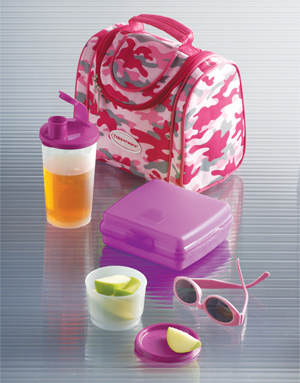 Receive a free Camp Lunch Set for your child (regularly priced at $24)! your name and address in your e-mail. will be notified via e-mail. Good luck!